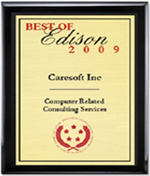 Caresoft Inc has been selected for the 2009 Best of Edison Award in the Computer Related Consulting Services category by the US Commerce Association. "The success of our company has always been closely tied to the growth and vitality of our service area," said Deepak Khare, president and CEO of CaresoftInc. "The ambitious group of our employees has made it possible and we are continuing our commitment to the IT Sector, we are privileged to serve. Our employees once again went above and beyond in surpassing this achievement." "We are deeply grateful that Caresoft Inc has been honored by the Edison Awards. Today, small businesses and entrepreneurs are facing the challenges of an increasingly competitive local economy. While many businesses have taken on various initiatives to continue to grow, a select few have been able to benefit from the strategic value of business awards. "We believe it (business awards) helps validate what we do in the company and enhances our ability to keep continue our services in IT sector." We are honored to be part of such a wonderful community." Rajeev Khare Director Business operations.